We rolled onto the ferry at Bellingham: my daughters Jennifer, Mikayla and my wife, Merrilee and photographer Sam Pyke, headed to southeast Alaska to ride a living tide of salmon. You can't get there by car. With less than 2,000 miles of roads and more than 30,000 miles of coastline, to get from place to place, the best way is by plane or boat. This time, we opted for the 418-foot Columbia, the flagship of the Alaska Marine Highway System, on its weekly turn up the inside passage. For some, the ferry is a floating campsite. Travelers crash on a couch, pitch a tent on deck or take a stateroom on the cabin deck. Some walk on, others drive on in anything from bicycles to motorhomes. We hit Ketchikan at seven in the morning and met Dragon London from the Ketchikan Visitors Bureau for a stop at the Deer Mountain Fish Hatchery. Here the tribe raises the kings and the coho that congregate at the mouth of Ketchikan Creek along with the native sockeye, pinks and chums. On the other side of the creek at the Totem Heritage Center, we saw totems carved from fallen cedar, preserved and laid to rest after standing for a hundred years. Outside, the salmon splashed in the creek and bears waited to haul them out of the river. That night we stayed at The Narrows Inn then headed north to Clover Pass Resort where we had a boat reserved for our run to Naha Bay. At Loring, Mark Edwards, the owner of Naha Bay Lodge met us on the dock and hopped in for the ride to Traitors Cove and Margaret Creek. From the water's edge, it was a one mile hike to Margaret Lake. We fished our way down, wading from run to run in the clear water over gravel bars that would soon be populated with pinks and silvers fresh from the ocean. Rainbows attacked the girls' Promise Keeper spinners. 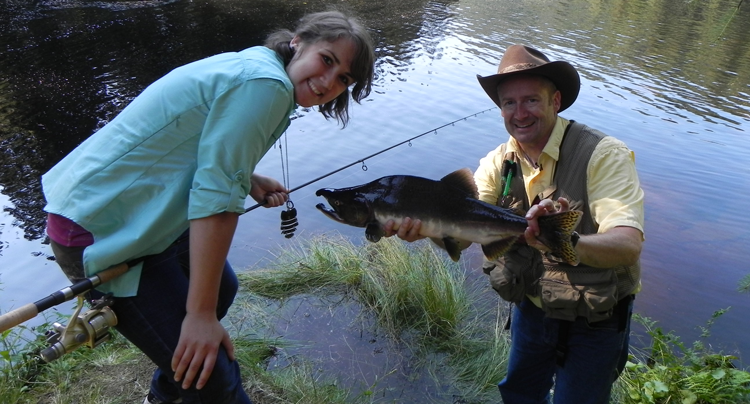 When Mikayla ran a wet fly in deep water, she caught a 14-incher. In the last pool, we found the salmon, maybe a dozen fresh fish. One grabbed a pink and purple streamer and streaked downstream then charged up to battle a circle around me at midstream before it threw the hook. Back at Loring, we cruised along the wreckage of the Ancon that slipped its lines there on a sunny day back in 1889. That evening, Merrilee remarked that we had yet to see a bear. Sam looked out the window and spotted an animal in the bay. A young black bear, it completed the mile and a half paddle from shore to shore then shook itself on the rocks. In the morning, we paddled out of Loring: Sam and I in one canoe, Merrilee and Mikayla in another and Jennifer in a kayak. It was 25 minutes around Dogfish Island to the tidal race of the Naha. From there, we portaged around the rapids, up into Roosevelt Lagoon and explored a mile of shoreline for the mouth of the Naha, found it and pushed half a mile up the river and dragged our boats ashore. I put on polarized glasses and scrambled up the bank. There in the shadows, a hundred salmon were stacked in the tea-colored water at the head of the first pool. Sam took the rod and pinned a pink salmon on a pink Promise Keeper spinner. When Mikayla tried it, she caught a rainbow. I set up a rod with a purple and pink jig and a float. It was seldom that the float would complete a drift without getting pulled under. A black bear showed on the opposite bank. When he smelled us, he sat down and scratched, first with his back right paw and then around his body all the way from his tail to the tip of his nose. He was the first of five bears we saw in 200 yards of river, everything from a half-grown cub to a battle-scarred boar. We watched bears fish, posture and prospect while we battled pinks and hoped they stayed on their side of the river. Gary Lewis is the host of Adventure Journal and author of John Nosler – Going Ballistic, Black Bear Hunting, Hunting Oregon and other titles. Contact Lewis at www.GaryLewisOutdoors.com. Go guided or fish on your own. This is a great opportunity to sample one of Alaska's legendary salmon runs. If you're interested in making this trip to Alaska with Gary, send an email and let us know.